Phillip Thomas Solatorio, aka 'Anakala (Uncle) Pilipo, was born on May 29, 1939, in Hālawa Valley on the island of Molokai, Hawai'i. When he was five years old, his mother, Helen Kawa'a, passed away. Pilipo and his three siblings were adopted by his mother's first cousin and her husband, Rose Kamana'o and Ilino Solatorio. They were taro farmers. The children worked in the taro patches (lo'i) before attending classes each day at the Hālawa Valley School. 'Anakala Pilipo vividly recalls April 1, 1946, the day that the tsunami (kai e'e) came ashore in Hālawa Valley and wreaked havoc on the land and her people. Wanting to see the world beyond the valley, he joined the U.S. Navy at age sixteen. His travels eventually led him to Long Beach, California, where he met and married three years later 'Anakē (Aunty) Dianna. The Solatorios raised their six children on Molokai, where 'Anakala Pilipo has always worked as an ambassador of Aloha. His favorite jobs were those that allowed him to interact with visitors to the island — sharing the Aloha spirit — whether it be as a tour guide or by writing a weekly column for the Molokai Dispatch called "Mahalo for Asking." He held the title of Honorary Mayor of Kaunakakai from 1962 to 1964. For thirty years, he worked for Molokai Ranch. As manager of the Wildlife Game Park, he was responsible for the welfare of over 1,000 wild game animals. He led tours of the park and was famous for delighting the guests by highlighting the animals' "unique behaviors" -- including an ostrich that knew how to "hula" on command! As cultural specialist at the ranch, he shared traditional Hawaiian arts and crafts. He kept the guests mesmerized with his stories of growing up "Hawaiian-style" in the remote valley of Hālawa. His numerous awards include the 2005 Kāhili Award from the state of Hawai'i in recognition of his efforts to promote Hawaiian culture. 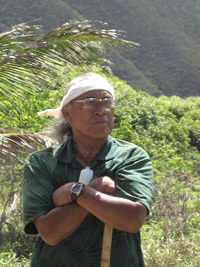 In 2008, 'Anakala Pilipo and 'Anakē Dianna returned to his beloved Hālawa Valley. Their home sits on the footprint of the house where he was raised. The lo'i are open once again. Most days he can be found tending to his taro and leading the valley's visitors through a cultural protocol — a traditional Hawaiian welcoming ceremony before they hike to the spectacular Mo'o'ula Falls. Or you may find him talking story with the locals in town. Instantly recognizable — adorned with a ti leaf lei, kukui lei and his boar's tusk necklace, he is a living reminder of Molokai's rich history. He is a revered Kumu Hawai'i, a master teacher of Hawaiian culture. He strives to "keep it Hawaiian." His motto: "Aloha i kekahi i kekahi." Love one another.